Please read carefully and follow these steps. 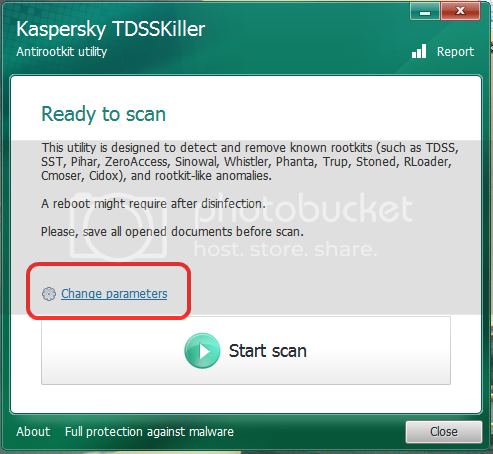 Download TDSSKiller from here http://support.kaspersky.com/downloads/utils/tdsskiller.exe and save it to your Desktop. Doubleclick on to run the application. 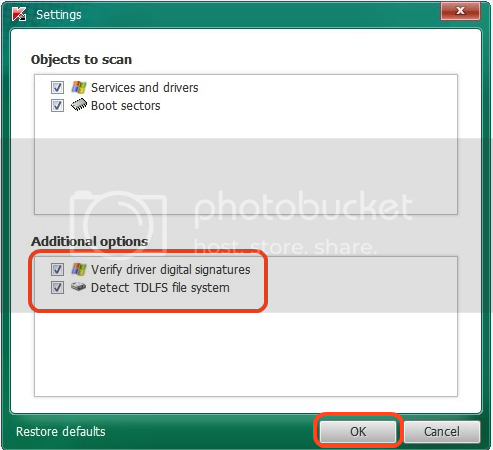 The "Ready to scan" window will open, Click on "Change parameters"
Place a checkmark next to Verify Driver Digital Signature and Detect TDLFS file system, (Leave "Service & Drivers" and "Boot Sectors" ticked. Click OK. 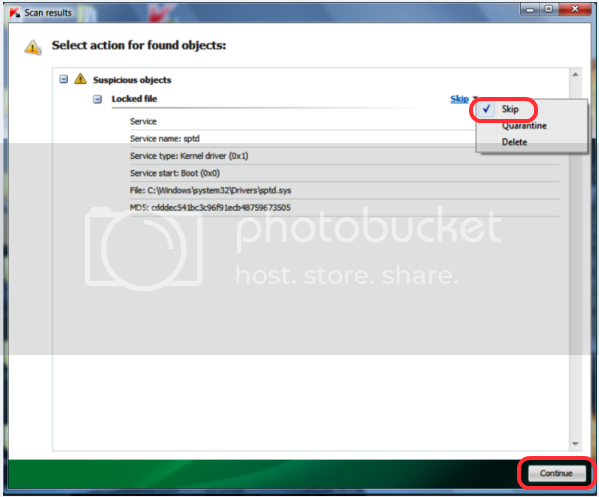 If an infected file is detected, the default action will be Cure, change to Skip then click on Continue. If a suspicious file is detected, the default action will be Skip, click on Continue. It may ask you to reboot the computer to complete the process. Click on Reboot Now. If no reboot is require, click on Report. A log file should appear. Please copy and paste the contents of that file here. If a reboot is required, the report can also be found in your root directory, (usually C:\ folder) in the form of "TDSSKiller.[Version]_[Date]_[Time]_log.txt". Please copy and paste the contents of that file here. 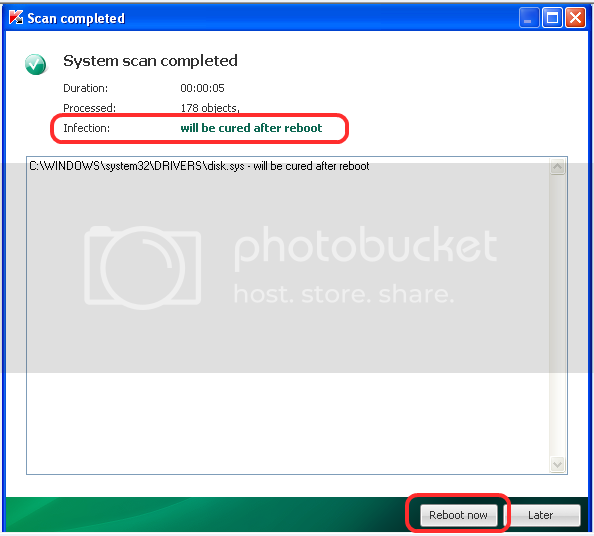 Please download aswMBR from here: http://files.avast.com/files/rootkit-scanner/aswmbr.exe Save to your desktop. There will be a short delay before the next dialog box comes up. Please just wait a minute or two. When asked if you'd like to "download the latest Avast! virus definitions", click Yes. Typically this is about a 100MB download so depending on your connection speed it can take a short while to download and become ready. On completion of the scan, click the save log button, save it to your desktop, then copy and paste it in your next reply. Note: There will also be a file on your desktop named MBR.dat do not delete this for now. It is an actual backup of the MBR (master boot record). The message exceeds the maximum allowed length (65000 characters)." I tried to delete few lines at the top but it still wouldn't let me post. For the aswMBR program it told me my computer supports virtualization technology and asked if I want to use it for rootkit detection. I've never heard of that so I didn't know whether to say yes or no. The first time I ran aswMBR the PC completely froze. The second time it ran fine though. There were a few different options for the AV scan I wasn't really sure what to choose so I chose the C drive. TDSSKiller said it found some files but they seem to just be an ASUS file and the mouse, chose skip like you said but it didn't cure so I'm not sure if it needed to or not. Those logs from TDSSkiller and aswMBR are clean, no malware or infection.... Run the following to clean up tools we`ve used. Download "Delfix by Xplode" and save it to your desktop. Now click on "Run" and wait patiently until the tool has completed. The tool will create a log when it has completed. We don't need you to post this. Hi, I refreshed FF and downloaded the add-ons a few times I had trouble with downloading them I kept getting errors. I'm also still getting the content encoding error and the secure connection error. I get both errors on different websites so its not always the same one. Close Firefox down, open Internet Explorer. Surf about with IE, do you have any issues using that browser? Ok, I tried using IE and I had loading problems on there as well. Sometimes it would just seem to hang there in loading until I pushed stop then reload. I also got a cannot display error on IE. Unzip the contents into a newly created folder on your desktop. 1. Select the Windows key + R key together to open the Run dialog box, type powershell.exe and press Enter. 2. In PowerShell, copy and paste the command below, and press Enter. Please download VEW by Vino Rosso from HERE and save it to your Desktop. Double-click VEW.exe. to start, Vista and Windows 7/8 users Right Click and select "Run as Administrator"
Under 'Select log to query...check the boxes for both Application and System. Under 'Select type to list... select both Error and Critical. Click the radio button for 'Number of events...Type 10 in the 1 to 20 box. Then click the Run button. Notepad will open with the output log. It will take a couple of minutes to generate the log, please be patient. Please post the Output log in your next reply. Thanks for the update and logs. I do not believe we are dealing with malware/infection, all recent logs do not incate any malicious entries. The Volume Bitmap is incorrect. Windows has checked the file system and found problems. Please run chkdsk /scan to find the problems and queue them for repair. Go to this link: http://www.eightforums.com/tutorials/6221-chkdsk-check-drive-errors-windows-8-a.html Scroll to and use instructions from "Option 2"
Use those instructions, make sure to use the /r switch command, chkdsk /r note the space between chkdsk and /r. When that completes use the instructions in reply #27 to locate and post the chkdsk log. Select Windows key and X key together, from the list select command prompt (admin) at the command prompt type or copy and paste sfc /scannow > then tap enter. When finished type exit Tap enter, re-boot your PC. ***Note the space between sfc and /scannow.